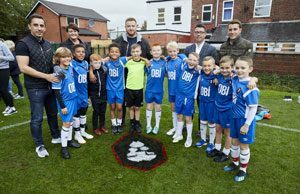 Children attending neighbouring Primary Schools, Lewis Street and Christ Church CE in Eccles, had the chance to experience their new playing surface for first ever time yesterday. Newly formed junior football club, Salford City JFC U10’s have teamed up with the two local schools to share facilities at the newly created sports field. The sports pitch, which will be the home of Salford City JFC U10’s, was officially opened by Gary Neville, who is an owner of Conference Premier side Salford City FC and chair Karen Baird at a special event attended by over 100 children, parents and the local community. Executive head teacher of both Lewis Street and Christ Church CE Schools Wendy McCormack said: “Our children have never been able to play on a proper grass playing field and I was delighted when Will Lewis of OBI approached me to see if we would share it with Salford City JFC. OBI founder Will Lewis is chairman of Salford City JFC U10’s and had been looking for a home for the team. He heard the two primary schools had some land which could become a sports pitch but they needed help to bring it up to a safe standard for children to play on. Will Lewis said: “Helping to turn the derelict land into a high quality sports pitch so the children can play on it in safely, was a whole new experience and it’s been amazing to see the effort from the players’ parents and kids themselves to help make this happen. Local resident Craig Doyle must have mowed the pitch 30 times in the past six weeks and that just shows the sort of commitment gone into this. OBI also brought in one of the world’s leading experts on sport’s pitches Charles Henderson to provide practical advice and support to ensure Salford City JFC will be able to keep the pitch in top condition. Charles works for PSD Agronomy Ltd, a sports pitch consultancy company that works with football and rugby clubs from grassroots to the Premier League.